I haven't been keeping still and neither has Dr Livingstone. I finished my thesis in August and have been trying to catch up on all the little bits of work that have been looming around the corner in and outside the house. A lot has changed over the past year and I haven't really shared a lot. It seems I do not have a single spare moment to chillax and blog about what has been going on. But things have moved forward and we're both chuffed to bits at all the improvements we've finally been able to do. Most of the daunting chores have been dealt with. The most dreaded tast of all was chopping up all the pallets that had been stored in the stables. We'd been hoarding them from everywhere. Roughly estimated we had about sixty of them. Crazy neigbour™ was very kind to lend his saw table AND help Dr Livingstone to do the sawing business. They were at it for an entire afternoon, had tea and biscuits afterwards in the garden and then were unable to move because of aching joints and muscles the day after. But what a result! After that Dr Livingstone and myself also made all the long bits into shorter fire wood to get the stove going. We now have three entire Big Bags full of start-up wood which will probably last us several years to come! I also managed to paint all the hinges and metal work on the stable doors and together with the sidings I had already painted a trout colour last year it looks much better. We also cleared away all of the bits and ends that always keep lurking about. Several trips to the recycling park later (can't say container park anymore according to the Council) it all looks pretty tidy now. 1) clearing out and organizing our composting station (Dr Livingstone did make three tub-like structures but then proceeded by just chucking everything random in there). 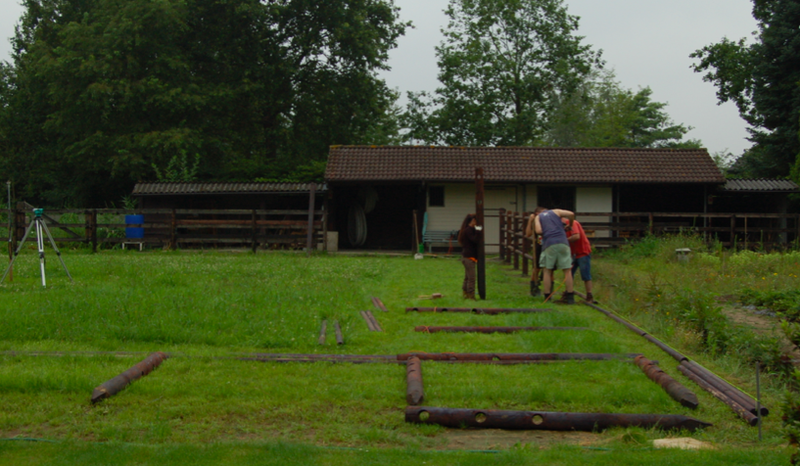 2) clearing out and organizing the shelter next to the stables. There are still a lot of roof tiles there. We're also going to use the fire wood piled up in there this winter so it can be emptied out. We're planning to use it as a kind of temporary locker/preparation shelter for anyone wanting to make saddles ready or put some horse riding utensils in a locker. 3) make a nice path next to the stables and make a little door so we can enter the garden from the public footpath that runs across our land. Dr Livingstone already dug a ditch to pump excess water into the little brook in case of heavy rainfall.